Zerina, a CIEE-placed American-Serbia and Montenegro Youth Leadership Exchange (A-SMYLE) student from Montenegro, came to the United States determined to have her best year yet. She excels in her academics and loves school. Her favorite class is forensic science and she is a member of the Key Club. Zerina is also learning to play the guitar and after school keeps busy as a member of a theater crew. Zerina is not shy when it comes to representing her country; in addition to sharing her culture with her friends on daily basis, she gave two very creative cultural presentations at her school. 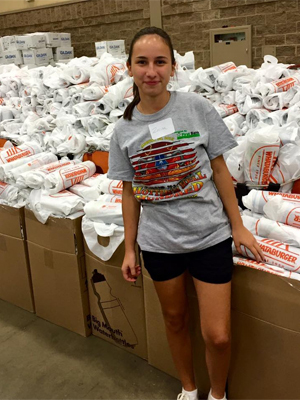 Having already completed over 50 hours of community service, Zerina persistently works toward her goal of completing 100 hours. She is not afraid of hard work, which she proved while working on several huge community events such as the Hotter' N Hell Hundred Cycling Week and the City Lights Holiday Parade. In addition, Zerina enjoys cooking for a woman in need in the local community. She also works weekly volunteering as a student attorney for Wichita Falls’ Teen Court. Furthermore, she helps her host parents as they help with children at church and is a dedicated member of the youth group. Zerina’s host family said she is a joy to them. She has become very close to her host sister who has special needs. Zerina and her host mom regularly workout together at the local YMCA where they enjoy attending a spin class. Furthermore, her host father is running for a public office and she is excited to see democracy in action. True to her word, Zerina is doing a tremendous job as a host daughter and sister, student, volunteer, representative of her country and friend to many.